Today the French Final CPI m/m, the Industrial Production m/m and Consumer Prices in Germany affect EUR and in the US, 10-y Bond Auction, Retail Sales m/m and Crude Oil Inventories affect USD. EURUSD is finding support at 1.13550 with resistance at 1.13870 which are both above the monthly pivot point at 1.1203. The pair is staying neutral for the moment and is showing consolidation pattern from 1.14645. 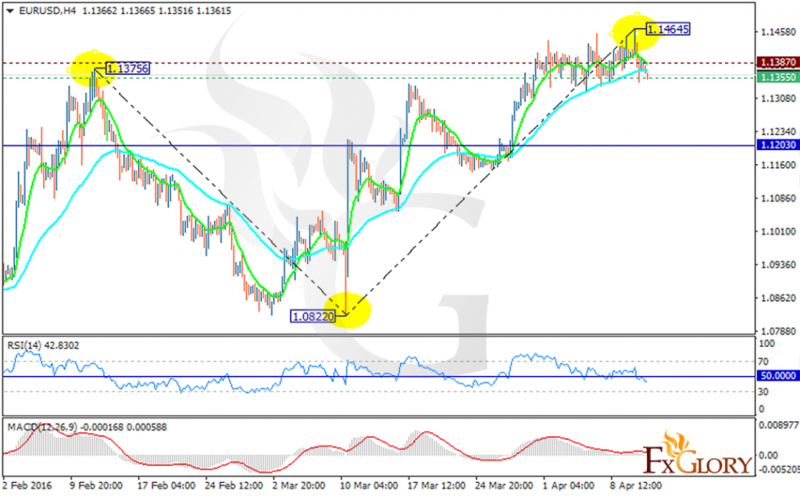 Considering the long term picture, the pair had been correcting the sudden fall to 1.08220, as the EMA of 10 is above the EMA of 50 and now it might be time for the price to reach its monthly pivot point at 1.1203. The RSI is below the 50 level which indicates price fall and the MACD indicator is in neutral territory not providing a clear signal for traders. The 1.1464 breakout will be a good signal for buyers showing a steady growth to 1.1550 otherwise the support level breakthrough will lead the price to further decline.